Friday, July 13, 1888 Quite cool, pleasant but windy. Our folks about as usual & quite as busy. Ellery about home most of A.M. he removed bedstead & bedding from my room, for good airing, he giving bedstead thoro' cleansing &c, helping to replace all when home to dinner. As well self, & with extra work of brushing bedding & putting to rights, busy till mid P.M. after which enjoyed short visit from "Addie Bartlett" she was in to see Ch-. Saturday 14 About as cool, after quite little rain in night, & cloudy most of day. 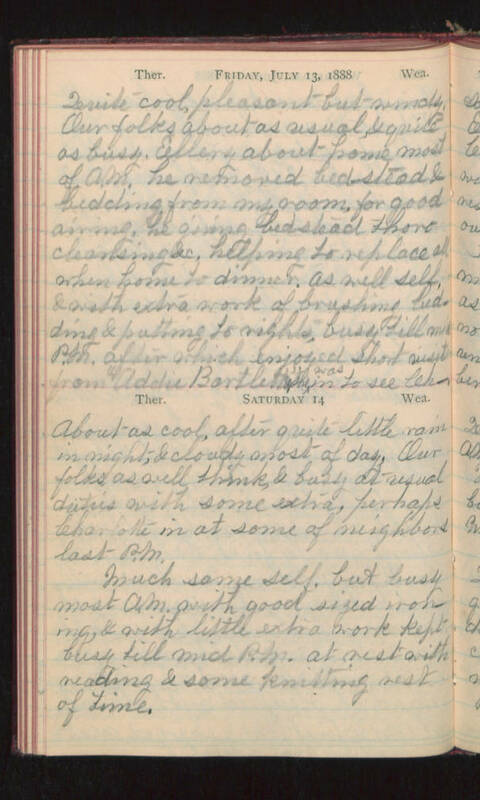 Our folks as well think, & busy at usual duties with some extra, perhaps Charlotte in at some of neighbors last P.M. Much same self, but busy most A.M. with good sized ironing, & with little extra work kept busy till mid P.M. at rest with reading & some knitting rest of time.